Lapland Longspur - Montague, Franklin Co., MA. December 13th, 2018. Passerines continued to capture most of my personal interest through to mid-December. To date (Dec 16th), Common Yellowthroats (1 - 2) are still present in the Northfield Meadows, seemingly happily foraging around a completely frozen cattail pond. How these birds will fair during the remainder of the month remains to be seen but for now it certainly looks like an attempt at over-wintering. Common Yellowthroat (first-winter male) - Northfield Meadows, Franklin Co., MA. December 12th, 2018. The excellent sequence of Franklin County Lapland Longspurs continued on Dec 13th with another found in a smallish flock of Horned Larks in Montague. Just outside of Franklin County, there was a super Northern Shrike at Whitingham, Vermont on Dec 16th just a few miles north-west of Colrain, Mass. Lapland Longspur - with Horned Larks, Montague, Franklin Co., MA. December 13th, 2018. Northern Shrike - Whitingham, Windham Co., VT. December 16th, 2018. Otherwise, a steady series of flyover Common Redpolls ( 1 - 5) and Evening Grosbeaks (1 -3) over several sites in Northfield, Gill and Turner's Falls during Dec 9th - 12th. Cackling Goose - Turner's Falls, Franklin Co., MA. December 12th, 2018. Cackling Goose - Northfield Meadows, Franklin Co., MA. December 10th, 2018. (Greater) Snow Goose - adult, Turner's Falls, Franklin Co., MA. December 12th, 2018. Water birding around Turner's Falls has been 'steady' with a Cackling Goose, quite possibly the same individual adult, being recorded at multiple sites from Northfield through to Turner's Falls between Dec 1st - 16th (multiple observers). A Greater Snow Goose spent all day loafing with Canada Geese off Unity Park before suddenly departing at dusk with the very first flock that decided it was time head south. Also of note, a Long-tailed Duck at Turner's Falls Rod and Gun club on Dec 4th, and a very late Double-crested Cormorant on Nov 29th. Long-tailed Duck - autumn male, Turner's Falls, Franklin Co., MA. December 4th, 2018. Double-crested Cormorant - Barton Cove, Gill, Franklin Co., MA. November 29th, 2018. Gull watching at Turner's Falls was quite promising in early December with up 9 individual Iceland Gulls identified including three adults, and up to four Lesser Black-backed Gulls though numbers of both species had tapered towards the middle of the month. Barred Owl - Gill, Franklin Co., MA. December 2nd, 2018. Barred Owl - Montague, Franklin Co., MA. December 12th, 2018. Image appears courtesy of Brian Kane. Finally, Barred Owls continue to be heard and seen around much of Franklin County and it seems pretty clear that we have an incursion of birds from further north supplementing our resident population. Sadly, as with other incursion years, this has included a lot of road-killed Barred Owls. Yellow-billed Cuckoo - Higbee Beach, Cape May Island, NJ. October 14th, 2018. Image appears courtesy of David Hughes. We started bright and early once more heading straight over to the Higbee Beach dike at first light. The morning was much calmer than the previous days with very little wind but rather cloudy. As a result many migrants were already quite high etched against complete cloud cover making them nearly impossible to identify to any level of satisfaction. Instead, we focused on the migrants feeding and resting along the dike and ended up having a nice, bird rich walk with good numbers of Yellow-billed Cuckoos (7-10), Black-throated Blue Warblers, Palm Warblers (both subspecies), White-crowned and Lincoln's Sparrows, Yellow-bellied Sapsuckers, Golden-crowned and Ruby-crowned Kinglets, Red-breasted Nuthatch, Yellow-rumped and Blackpoll Warblers, and more Brown Creepers. Lincoln's Sparrow - Higbee Beach, Cape May Island, NJ. October 14th, 2018. Baltimore Oriole - Higbee Beach, Cape May Island, NJ. October 14th, 2018. Pine Warbler - Higbee Beach, Cape May Island, NJ. October 14th, 2018. Red-breasted Nuthatch - Higbee Beach, Cape May Island, NJ. October 14th, 2018. Wood Ducks - Higbee Beach, Cape May Island, NJ. October 14th, 2018. Yellow-billed Cuckoo - Higbee Beach dike, Cape May Island, NJ. October 14th, 2018. A quick visit to the Hawkwatch platform at Cape May State Park was rather quiet where several small kettles of Broad-winged Hawks proved to be the highlight. Ducks on bunker pond included a clear influx of Gadwall and the continuing drake Eurasian Wigeon. Black, Surf and White-winged Scoters - Avalon, Cape May Co., NJ. October 14th, 2018. From there we headed north to the Avalon Seawatch which picked up towards the evening after a fairly slow start. Some 2000 scoters of all three expected species headed south with Red-throated and Common Loons, Northern Pintail, American Wigeon and American Black Duck all involved in the movement. We also enjoyed good numbers of Northern Gannets and a handful of Parasitic Jaegers. A Swamp Sparrow in the dunes behind the seawatch hut provided some entertainment during the quieter spells until David cranked it up a gear finding three American Oystercatchers, a Lesser Black-backed Gull and a Piping Plover in the final hour of daylight! The latter turned out to be the only Piping Plover of the entire trip - well done David! MA - two, maybe three Common Yellowthroats in Northfield! this male being outwardly aggressive towards Savannah and American Tree Sparrows. Is this an attempt at over-wintering? Common Yellowthroat (first-winter male) - Northfield Meadows, Franklin Co., MA. December 9th, 2018. This morning I returned to the scene of the previous day's Common Yellowthroat sighting in Northfield Meadows. My expectations of a repeat performance were not high after another very cold night - it was 11 deg F in Northfield at dawn. It was very nearly birdless for a good twenty minutes or so until a small olive toned warbler caught my eye and I knew I had the Common Yellowthroat once more. As I settled down to try and get some record shots another Common Yellowthroat started calling about 12 feet away and it wasn't long before I was watching two Common Yellowthroats flitting through the cattails together. That just seemed crazy for a bitterly cold morning in December! I tracked them as best I could before eventually losing sight of them towards the back of the cattails. As I watched, a third bird started calling that might also have been a yellowthroat, but for now I'm erring on the side of caution and going with two birds - one (first-winter) male and one female. Update: at least one (first-winter male) still present on Dec 12th, with 2 on Dec 11th and 4 seen and heard on Dec 10th - remarkable! Common Yellowthroat (female) - Northfield Meadows, Franklin Co., MA. December 9th, 2018. Common Yellowthroat (first-winter male) - Northfield Meadows, Franklin Co., MA. December 8th, 2018. Earlier, the day had gotten off to a terrific start with 5 Evening Grosbeaks and my first Common Redpoll of the season flying over North Cross Road, Gill. Red Crossbill (male) - Montague Plains, Franklin County, MA. December 5th, 2018. Identified as 'eastern' Type 10 after analysis of the sound recordings by Tim Spahr. Passerines of interest this week included six Red Crossbills in the Montague Plains on Dec 5th, identified as 'eastern' Type 10 after analysis of sound recordings taken at the scene. The flock was skittish, mobile and difficult to pin down so I was quite happy to come away with a handful of shots and a decent recording. In the same area, a lose flock of some 15 - 20 Red-breasted Nuthatches was no less impressive. Evening Grosbeaks (1 - 3) flew over North Cross Road, Gill every morning during Dec 1st - 5th, with another 3 over Turner's Falls Airfield on Dec 5th. A wide scatter of wandering Snow Buntings with 25 on Upper Farms Road, Northfield on Nov 30th, 11 on River Road, Gill on Dec 2nd and a single (male) over North Cross Road, Gill on Dec 6th. Skulkers included a smart Winter Wren on Pine Meadow, Northfield on Nov 30th with two together in Northfield Meadows on Dec 7th, and another on North Cross Road, Gill on the 8th. 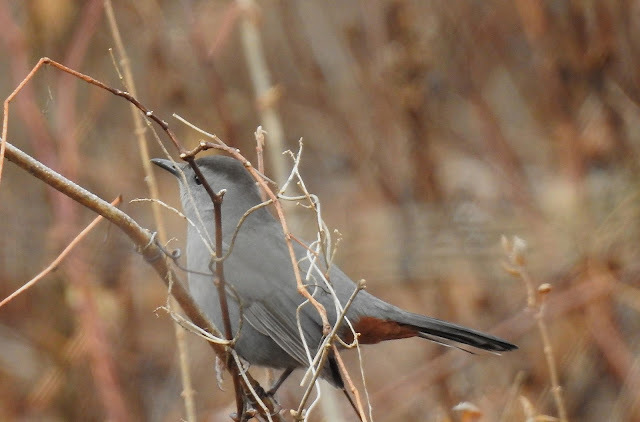 Dawn Winkler and Harvey Allen found a late Gray Catbird at Bennett Meadow, Northfield on Dec 3rd, and a very late Common Yellowthroat showed up in Northfield Meadows on Dec 7th & 8th. Red Crossbill (female) - Montague Plains, Franklin County, MA. December 5th, 2018. Red-breasted Nuthatch - Montague Plains, Franklin County, MA. December 5th, 2018. Red-breasted Nuthatch - Montague Plains, Franklin Co., MA. December 5th, 2018. Winter Wren - Pine Meadow Road, Northfield, Franklin Co., MA. November 30th, 2018. Gray Catbird - Bennett Meadow, Northfield, Franklin Co., MA. December 3rd, 2018. Image appears courtesy of Dawn Winkler. Baer's Pochard (male) - with Mallards, Fannie Stebbins Refuge, Longmeadow, Hampden Co., MA. December 3rd, 2018. Yesterday morning (Dec 3rd) I traveled south to Fannie Stebbins Refuge in Longmeadow with the goal of trying to see a long staying Baer's Pochard, apparently present at the refuge since early October. Curiosity certainly got the better of me and since I'd never seen a Baer's Pochard anywhere, wild or captive, I felt that there was little to lose by taking a look and I wasn't disappointed. The bird itself, an adult male, was extremely beautiful and very easy on the eye. It was diving frequently and engaged in short flights whenever the accompanying Mallards 'spooked' from foraging and flew back towards the protection of the cattails at the rear of the pond. It's a free flying bird, fully winged and not decorated with any bands of any kind. Watching it behave within the context of a relatively natural environment turned out to be a much more rewarding experience than expected. The Baer's Pochard at Longmeadow is currently regarded as an escape from captivity, and I guess with good reason. The species is endemic to East Asia and listed as "Critically Endangered" by Birdlife International with a population estimate of 150 - 700 individuals remaining in the wild. It is migratory breeding in the Russian Far East but even so, vagrancy to the Eastern US doesn't seem to be particularly plausible. On the other hand, an unbanded, free flying Baer's Pochard requires some explanation. Inquiries spearheaded by Michele Moore have apparently drawn a blank in terms of the bird's origin which, for now, remains unknown. Baer's Pochard occurs in collections at a number of locations in the Eastern US, but even in captivity it appears to be rare with the global captive stock estimated at around 220 birds in 2015 (Richard Hearn, WWT). Naturally, if captive breeding programs have been successful since that time the current figure could be much higher and it's perfectly acceptable to assume that this unbanded male has slipped away from one of the collections located in the Eastern US. Update December 11th; the Longmeadow Baer's Pochard was last reported at Pondside Road, Fannie Stebbins Refuge on December 4th (Michelle Moore), and on the Connecticut River near the Pioneer Valley Yacht at Anthony Road, Longmeadow on December 9th (Nick Paulson). Baer's Pochard (male) - with Mallard, Fannie Stebbins Refuge, Longmeadow, Hampden Co., MA. October 25th, 2018. Image appears courtesy of Joe Oliverio. Baer's Pochard (male) - Fannie Stebbins Refuge, Longmeadow, Hampden Co., MA. October 25th, 2018. Gracious thanks go to Al and Lois Richardson for the bringing the initial identification to my attention in late October and for keeping me up to speed on the bird's appearances, and equally gracious thanks go to Joe Oliverio for allowing me to use three of his excellent images within this post. Thanks to David Sibley for his input on the identification and for sharing references on the status of Baer's Pochard. Although there are no accepted records of Baer's Pochard in North America, David highlighted a mostly forgotten report of a specimen taken in "Oregon Territory" in 1841 that wasn't identified until 1949. It was considered unacceptable by the AOU in 1998, with comments suggesting that the specimen was most likely a hybrid. I'm very open to comments on this particular bird and whether or not it can be traced to a collection. I'm equally interested to receive comments on the current status and distribution of Baer's Pochard, in particular out of range occurrences. Thanks in advance.